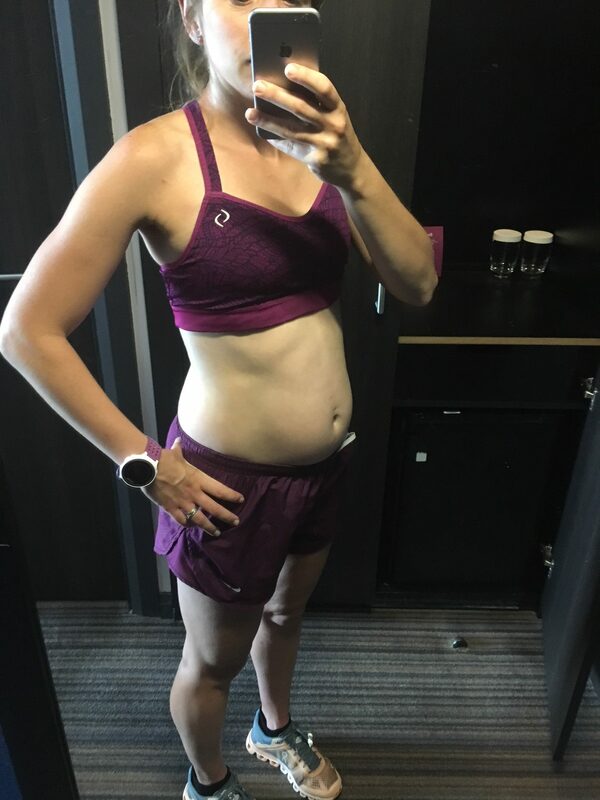 Last time I wrote a blog I was close to 17 weeks pregnant I was hoping that I would be updating the blog a bit more, but as we hit the summer months I always get a burst of new clients so my focus goes towards helping them achieve their summer bodies. There is a lot of joking between clients and myself at the moment; quite a few are on weight loss journeys they’re losing the pounds whilst I gain them. The only pounds I’m losing are from my purse overloading on baby items!! I’m now 6 months pregnant 24.5 weeks! I felt like weeks 12-20 went really slow, but the past 4 weeks have gone super quick. It’s crazy that in another 3.5 weeks I will be at the end of trimester 2 entering the final straight. Over the past 8 weeks, there have been noticeable changes from my body. I have gained 6kg in total so far, which is just shy of 1 stone it look’s like I’m on track to where I should be. People often ask how it feels to be running with the extra weight. It’s been a gradual process so I feel like it’s not been too dramatic, but those 7.30 miles are no longer feeling comfortable and I’m closer towards 8-minute miles. The extra weight is definitely having an impact on my body especially my skin. Last week I developed my first stretch mark, which is just below my ribs. I was horrified when I first saw this purple mark, it looks like someone has got a purple pen and drawn some lines on my stomach. I thought that using bio oil and palmers stretch mark cream I would escape the mark, however, the reality is that some people get them and others don’t. You will find a list on Google of how to prevent them…. The usual stuff; exercise, eat healthily, drink water and moisture twice a day. I do all of this and it’s made no difference at all. Lot’s of mum’s say they have these marks to celebrate. I would be a liar if I sat here saying I’m celebrating my first one! I’m also struggling with a lot of chafing. I have had to abandon the heart rate monitor on a lot of runs because it’s so uncomfortable underneath a sports bra. I tried using plasters, and I have used Vaseline, but nothing seems to work and instead, the skin keeps breaking and re-bleeding….. The joys of trying to run in trimester 2! My training load has certainly decreased over the past month. I’m still trying to do a Sunday longish run the aim is to do 1 hour and I try to do 45/50 minutes on a Saturday. I find that during the week I feel terrible on runs. I don’t think it helps that I spend a lot of time driving between clients I think on an average I drive around 375-400 miles a week. So I try and run between 25-45 minutes during the week and on weekends try to increase it slightly as long as I feel ok. I’m probably running around 30 miles a week. My main aim is to keep active and run for as long as I can. The majority of the training is just easy running but sometimes I like to change it up slightly. One Saturday, Andy went to the track so I decided I would do a few track reps. I ended up doing 4×600, 4×400 meters. I was running 88-90 seconds laps, which I was pretty pleased with just below 6-minute miles. It’s a far cry from the 76’s and lower, but previously I wasn’t running with a mini football underneath my vest! Yesterday, I did a hill incline session. I did 5x 90 seconds hills with a jog back. Sometimes I get fed up of just steady running and I often feel more comfortable running at a quicker pace for a shorter duration. With the recent heat wave, I also don’t like to be out too long. Last weeks Sunday long run was awful I stopped three times to just cool down when I came home I drank 2 litres of water and sat there with an ice pack on to cool me down. It all sounds very dramatic, but I wanted to make sure we didn’t overheat! There is another reason why I’m decreasing my running load and this is because I think I might be developing something called symphysis pubis dysfunction or known as pelvic girdle pain. This is quite common for pregnant women to develop. I first felt a bit of pain in my pelvis 2 weeks ago, it’s not overly sore but I’m aware that something isn’t quite right. Some runs I won’t feel it at after a few minutes and on others, it’s really uncomfortable. The pain increases particularly if I’m running down a long sharp hill and if I’m on bumpy surfaces. I’m unable to balance on one leg because the pain gets too much. Something as silly as trying to put leggings on has to be done by sitting down! Like any niggle, I will just try and manage it and be smart. I have bought myself some cycling shoes so I’m going to substitute some runs with cycling on the turbo. Cramp is also my new best friend. Another side effect of being pregnant! So I’m also trying to make sure I’m hydrated throughout the day and hoping for the best when I move around at night. I’m not painting a great portrait of trying to keep fit whilst pregnant! Just a small bit on nutrition. You’re advised to increase your calorie intake by an extra 200 calories a day. Personally, I haven’t got hooked up on this. If I’m hungry I’ll have something if I’m not then I won’t. I still have no cravings, however, I do like to have a mini magnum whilst watching Love Island!! I have continued to take the pregnancy vitamins. For dinner, I try and eat fish once or twice a week, mince and a steak each week, and have either turkey or chicken for the other days. I’m in the mindset of not over-complicating nutrition and just eat like before. With the heat, I feel like I’m thirsty all the time. I’m aware that my body needs more fluid so after runs I have been having drink fruit smoothies and lots of water! I’m aiming to drink between 3-4 litres a day! Hopefully, I won’t take as long to update the next blog! !